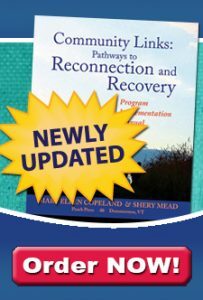 The first step in developing your own Wellness Recovery Action Plan, is to develop a Wellness Toolbox. This is a listing of things you have done in the past, or could do, to help yourself stay well, and things you could do to help yourself feel better when you are not doing well. You will use these “tools” to develop your own WRAP. If you are using a binder, insert several sheets of paper in the front of your binder. List on these sheets the tools, strategies and skills you need to use on a daily basis to keep yourself well, along with those you use frequently or occasionally to help yourself feel better and to relieve troubling symptoms. Include things that you have done in the past, things that you have heard of and thought you might like to try, and things that have been recommended to you by health care providers and other supporters. You can get ideas on other tools from self-help books including those in my books like WRAP Plus , The Depression Workbook: A Guide to Living With Depression and Manic Depression, The Worry Control Workbook, Healing the Trauma of Abuse, The Loneliness Workbook. 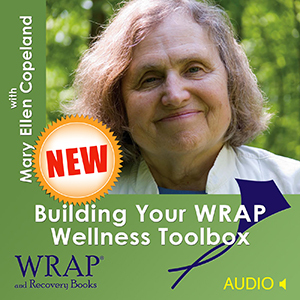 You can get other ideas from listening to WRAP Step-by-Step and Wellness Tools available on CD and audio download. You can also go to the section on this website to see what others have shared. The following list includes the tools that are most commonly used to stay well and help relieve symptoms. Refer to these lists as you develop your Wellness Recovery Action Plan™. Keep it in the front of your binder so you can use it whenever you feel you need to revise all or parts of your plan. Click here for even more Wellness Tools ideas! Keep your Wellness Tools on hand with you always! The WRAP App – The WRAP App guides you in creating and using your WRAP day to day. Use the WRAP App and take control, with your personalized action plans that help you feel better, get well, and stay well for life.